UNIVERSITY CITY -- Celebrity chef Marc Vetri has teamed up with Drexel University to fight hunger in Philadelphia. Their project is called the Eat Café and customers pay what they can for a hot meal. The kitchen at the brand new café was a beehive of activity Wednesday, opening day, at 38th and Lancaster. They cut the ribbon late in the morning on the nonprofit partnership of renowned chef Vetri and Drexel. Experts say Philadelphia has the highest rate of deep poverty in the country. "The Eat Café is meant to be a beautiful and welcoming inclusive place where everyone can share a meal no matter their ability to pay for it," Professor Mariana Chilton of Drexel University said. "We're just happy to be able to share it with everybody else," Vetri said. Their pay what you can concept is a nod to the fact that one in four Philadelphians struggles with so-called food insecurity. "The Eat Café will be a place where everyone can have a meal without any embarrassment. No one will be turned away or made to feel less if they're unable to pay," Calla Cousar of the Community Advisory Board said. "Pay the suggestion price, which is good. Pay above the suggestion price, which is better. The better part helps provide not just the food on the plate, but the employment opportunities of the staff from this West Philadelphia community," General Manager Donnell Jones-Craven said. Others see it as a positive plan, as well. "We do have a lot of families here who have issues with hunger. The fact that anyone and everyone can come to the table and be involved in having a great meal and having a nice restaurant experience," Pamela Andrews of West Powelton said. 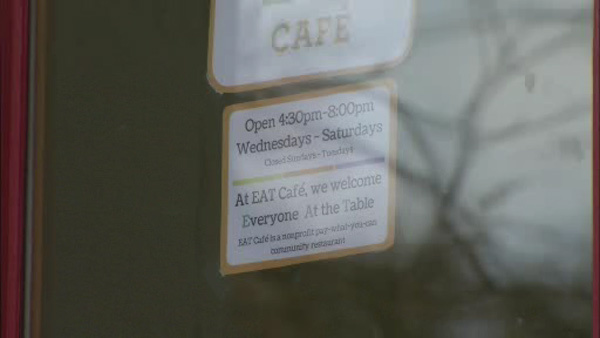 The Eat Café will be open Wednesday through Saturday 4:30 p.m. to 8 p.m., it's a noble gesture and unique social experiment in these tough economic times.